Once you understand how themes can make your proposal stand out, you’ll kick yourself several times for not doing so earlier. The ability to use themes in business proposals is one way to highlight the unique strengths of your bid. However there is some confusion as regards what it means to create a theme, how it differs from USPs, and whether all bids can be written theme-style. Let’s take a look at what a bid theme offers, and how you can develop it as part of your proposal development process. 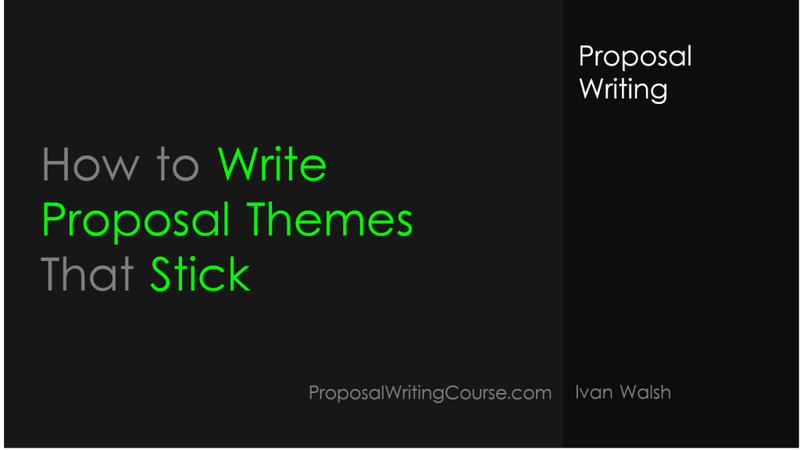 What is a proposal theme? A proposal theme contains a benefit and an example of how it will be implemented. If the agency awarding the contract wants to improve efficiency, you could develop a theme that describes the benefits of having, for example, an automated payroll system, and then give examples of how you would implement this, for example, using words and phrases that includes terms such as modular, re-use, extend, and best practises. In other words, you identify the underlying issue, in this case efficiency, and then look at ways you can ‘demonstrate’ how you would achieve this. Putting the meat on the bones, so to speak. Imagine for a second you were describing a proposal to a colleague. You’d probably have to think about this if the bid were written in the standard cold, objective style that most bids are written in. But if the proposal had been developed with themes in mind – in other words constructed to support the underlying values– you’d find it much easier to explain the gist of the bid, what made it different, and most importantly, what was memorable. The important part is that it’s memorable. I review proposals for agencies (and also ‘doctor’ draft proposals) and can see a significant different in those bids which include some element of theme development as opposed to those which seem to be simply going through the motions. Themes give your document a little ‘personality’. They become the pillars upon which you develop your values and try to connect to the reader on an emotional level. Anyone can say that their solution offers the best value. However, it’s how you persuade the reader that, of all the competitors, your company is the one that cares most about developing a solution and that one that has invested the most in the proposed offering. Again, think of when you send your child to school. It’s not just the education you’re concerned about. It’s the soft issues that also influence your decision. What are the school’s values? How will they develop your child as a person? What initiatives do they support? All of these influence your decision. It’s the same when awarding a government contract. Sometimes, it’s not only the price that decides who is awarded the contract. It’s how you – if you win the contract – will express the agency’s needs in ways that it can be proud of and stand over. So, if we follow this thread, we can begin to see themes as the ‘emotional tone of the narrative’ in the proposal. Themes develop values, give examples of how these will be developed, and give the reader confidence that you, more than any other bidder, has their needs at heart. Identify benefits – this involves reading the request for proposal carefully and isolating the emotional factors which are important to the awarding agency. For example, have they referred to working in partnership, cultural issues, or sustainability? Try to read between the lines. Ask yourself: why have they issued this RFP now? What were the underlying reasons that compelled them to seek external assistance? If you can identify these, and see where you can resolve these issues, start to develop themes that address these concerns. Expand related benefits – go one step further and identify the major features and support these with examples of how you have, and will, develop a solution that provides these features. Try to write the proposal so the reader can begin to see in their mind’s eye how you would work with them if you were to be given the contract. Create a benefits matrix – create a three column table and enter the benefits, feature, and proof in each column. The proof must be genuine, for example, related to a previous project you worked on, certification you’ve achieved, or an award you’ve been given based on past performance. Theme Statement – develop theme statements (e.g. examples that demonstrate your expertise and reasons why you offer the most compelling solution) which are connected to the customer’s benefits. In other words, make each theme statement address one benefit to the customer. Focus box – develop 3-5 bullet points for each theme statement. Keep these short. Use active words and avoid jargon. Refinement – Once you’ve finished this, take a step back to give yourself some distance. I find that if I leave the themes along for a day or so, when I return to it, I have a better understanding of what I was trying to say. It’s as though the themes are digested in the background when my mind is on other things. Develop themes that respond to the emotions that run through the RFP. Themes give your bid personality as they speak to the reader not so much in rational, logical terms, but in how you feel about the contract, and why you feel you’re best placed to do this work. One last thing: fake themes backfire. If you try to write themes based on values you don’t really believe in, this will come through in the writing. It’s hard to put your finger on what’s wrong – but it doesn’t feel right. So, be careful. Find writers who know how to develop themes. Look for examples. Go slowly and you go far.